MUSKOGEE – It’s been a long and not always smooth journey for Brady Richardson between Oklahoma Golf Association championships. 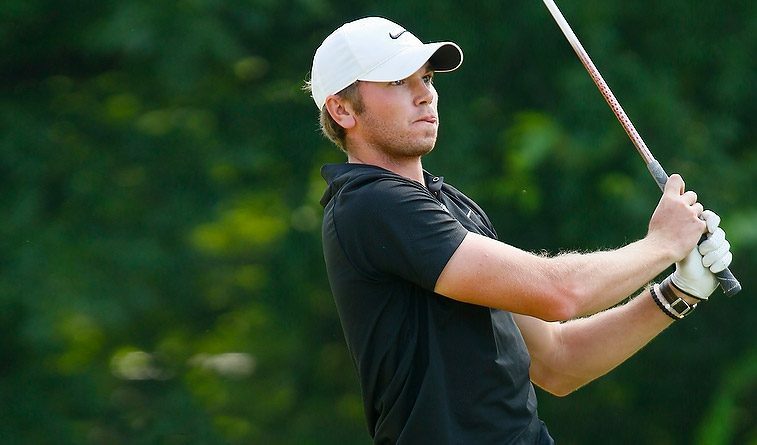 The 2011 OGA Junior champion from Union High School started his collegiate career at Drake in 2014, but got caught up in a partying lifestyle that eventually led to a transfer to Oklahoma Wesleyan in Bartlesville, where he has achieved a calmer, more grounded existence. His maturity was on full display in the 2017 OGA Stroke Play Championship at windy Muskogee Country Club Wednesday, as he tracked down Arkansas standout Mason Overstreet from behind with a 1-under final round of 70, then won a playoff with a birdie on the first hole. Both players finished regulation at 7-under par. Richardson drove his tee shot on the par-4 hole to the right and had to loft a wedge over a tall tree, but hit it to two feet. Brady Richardson and Mason Overstreet. Richardson had driven the green on the 360-yard first hole in the morning, leading to a two-putt birdie and giving him the confidence he could compete with the NCAA individual runnerup Overstreet of Kingfisher, who will be a sophomore this fall at Arkansas. Overstreet, who carried a two-shot lead into the final round after a second-round 66, hit only five greens in regulation Wednesday on the tight Perry Maxwell-designed course, but superb chipping and putting kept him either in the lead or tied until the 16th hole, when Richardson stuffed his approach to six feet while Mason’s tee shot hit a tree left of the fairway leading to a bogey. The two-shot swing put Richardson ahead by one and both players made par on the par-3 17th. Richardson hit his approach on the 18th over the pin onto a crest and he ran his downhill, downwind birdie putt some 15 feet past the hole and missed coming back, allowing Overstreet to tie him after he got up-and-down from left of the green, leading to the playoff. Overstreet , who began work on a swing change in earnest just prior to the event, caught another tree with his drive in the playoff and his ball stopped on a bare spot underneath. His pitch came up about 18 feet short. Richardson, who is waiting to hear from the NCAA whether he will be granted another year of eligibility at Oklahoma Wesleyan after missing most of one season with an injury, used a five consecutive birdie run in his second round 65 to put himself in contention, then probably saved his chances with a bogey that could have been much worse on the short par-4 14th in the final round. After hitting a tree left with his drive, Richardson rapped his second shot 40 yards past the green and near another tree. He tried to clear the bunkers behind the green with his third, but landed in one, short-siding himself to a pin in the back with the green running away. He splashed out to 20 feet or so and saved bogey with a putt that never left the center of the cup. Both players birdied the par-5 15th before the two-shot swing at 16 gave Richardson his first lead. Richardson said he intends to turn professional after his run at Oklahoma Wesleyan is over and credited his move there with rescuing his career. “It’s helped me tremendously,” he said. “I’m living a much more grounded, moral lifestyle. I have great friends like Garrett (Odom), my caddie this week, who helped me focus on just controlling what I can and not worrying about mistakes. Cody Burrows of Chicksaha and Oral Roberts Univeristy finished three shots back in third, followed by Nick Pierce of Sallisaw and Central Oklahoma and Eli Armstrong of Edmond and UCO, who tied for fourth at even-par 210.